The last few days we have had a couple of big laughs here on the boat. We thought we would share our latest bloopers with you. It seems lately we go swimming more with all our clothes on rather than just in our swim suits! I suppose it started about a week ago when we were pulling up to a beach in the dinghy to throw the ball for Lucy. I jumped off to catch the boat and pull it up the shore, only what I thought was 2 feet of water was actually 6 and so I went completely under fully dressed. The next day you all know I lost the camera out of my pocket. Not sure how that happened exactly? The day after the camera incident we were putting the jib sail back up and as Preston was threading the sail through the track I was using the winch to pull it up. We of course wound the line the wrong direction which lead to the sail being rolled up inside out. So we dropped it and started all over. This time the sail was up and we were just about to roll it in when.......click, bang, roll, bounce, hop, plunk, SPLASH! 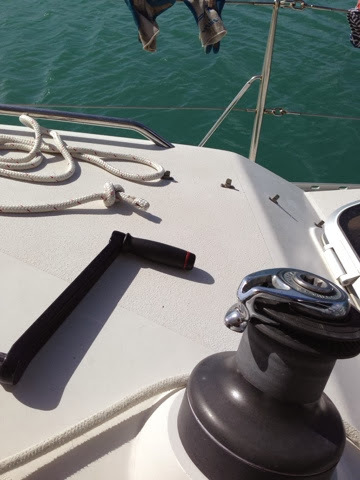 The winch handle went from the captains chair to bouncing overboard (the plunk). I then proceeded to flail my body over the lifelines (the splash) hand first trying to find the handle in 30 feet of zero visibility water. We were of course in the packed anchorage of Ponce and already had an audience because the sail was now flapping like crazy waiting for me to roll it in. The only problem was I was climbing up the back stairs soaking wet and Preston is asking what was that noise? Ohh the splash? That was me! Two days after the lost winch handle we were playing backgammon after lunch at Caja Muertos when Preston noticed the boat next to us was floating away, no longer attached to its mooring ball. Well there goes Preston overboard swimming for the runaway boat. Luckily this boat was our friends we had met in Ponce and Preston started yelling there names and they got the boat back to its mooring ball without any problems. Preston of course was soaking wet! Yesterday tops the cake. We had just come back from town on the dinghy. We had cleaned the boat a few days before and noticed Lucy was leaving muddy footprints and so we started scrubbing them away. 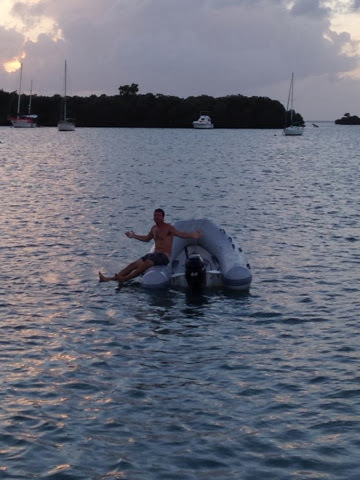 We were just about to go inside for dinner when Preston looked up and noticed the dinghy, floating away at least 50 yards behind the boat. We just flat out didn't even tie the dinghy to the boat when we got back. There goes Preston overboard again, stripped down to his undies and swimming to get our runaway dinghy. 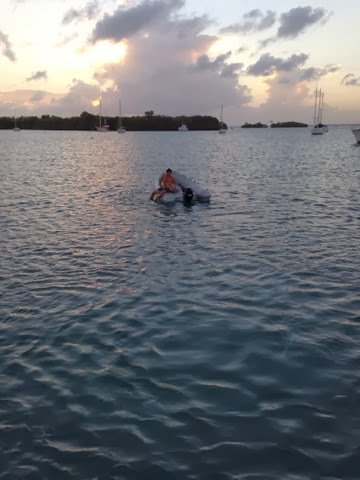 I threw him the keys just as he was jumping in and he and the dinghy made it back in one piece, well kind of. Soaking wet underwear does not stay on a body as well as a swim suit and so Preston was unknowingly showing the whole anchorage his half moon. As he pulled up I was laughing so hard I couldn't catch dinghy to tie it up. Now on my way back in the boat I walked into the screen door for the 2nd time in 2 days, just like the puppies on Americas Funniest Videos. Our karma must be off or something. Biorhythm slump, or maybe you should have checked your horoscopes and stayed in bed.